The holiday home has been designed with fairy tales in mind such as the Brothers Grimm or Hans Christan Andersen. Go on a discovery tour in our house and find the numerous allusions to Rotkäppchen, Rapunzel, Snow White or Hans in luck. In harmony with the plank floor, the furnishings and furniture were coordinated. A highlight in the living room is the reading area with its two rocking chairs and the more than 100-year-old piano, formerly owned by the Bad Wildungen Spa Orchestra. The fully equipped kitchen incl. Dishwasher and microwave integrated the dining area. Next to it is the completely refurbished bathroom with shower. In the 1. OG are the two bedrooms. The master bedroom has a double bed and the children's bedroom has two single beds, which can also be pushed together. Another corner bed, which can also be used as a sofa, is also in the children's bedroom. The garden with sitting and barbecue area is available to you alone. When the harvest season has come, you are welcome to use the two cherry trees. Swing and climbing wall, as well as the volleyball net invite you to play and run around. Holiday home double for up to 4 people with 3 rooms in two floors on 80 sqm. 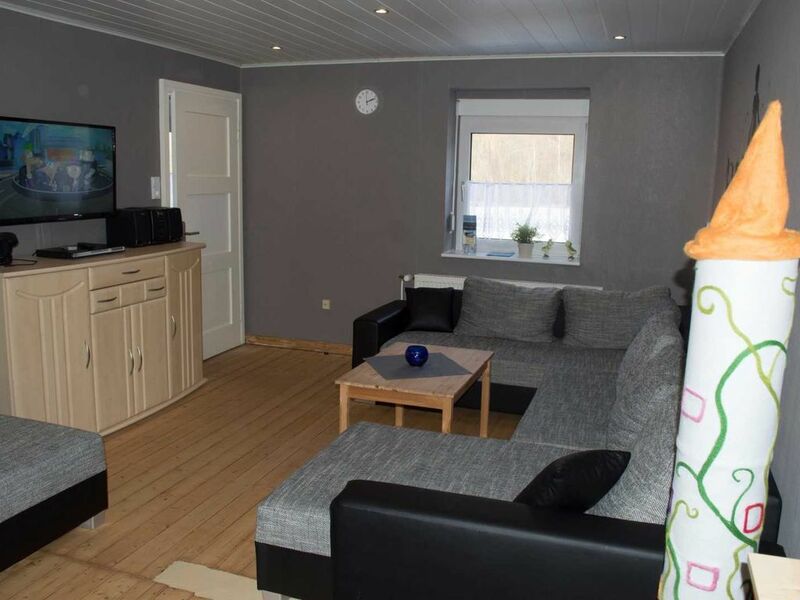 The spacious living room with satellite TV and large living area has an unobstructed view of the Ederaue. The living room and the bedrooms have a pleasant atmosphere through the plank floor. The dining area and a fully equipped kitchen with dishwasher, fridge and freezer and microwave are located on the ground floor. The two bedrooms, a double bed and two single beds, provide ample space, even for large families. Also a travel cot for the smallest guests is available free of charge on request. The bathroom has a shower, hairdryer and make-up mirror. The large garden with seating is the ideal place to grill, play or just relax. A volleyball / badminton net invites to sports activities. Bed and table linen, as well as bath towels, soap, dish soap and Spülmaschinentabs are included in the price. The house is located on the edge of the district Edersee below the Edertalsperre on a residential street. On the edge of the National Park Kellerwald-Edersee everyone gets their money's worth. Whether hiking, cycling, water sports, fishing or exploring the nature you will enjoy an absolutely relaxing holiday. 1000 meters to the supermarket with bakery and adjoining butcher. In addition, Hemfurth-Edersee offers a balanced mix of different dining options. In the immediate vicinity there are two playgrounds, a Wassertretbecken, a climbing park, wildlife park and the aqua park on the Sperrmauervorplatz.